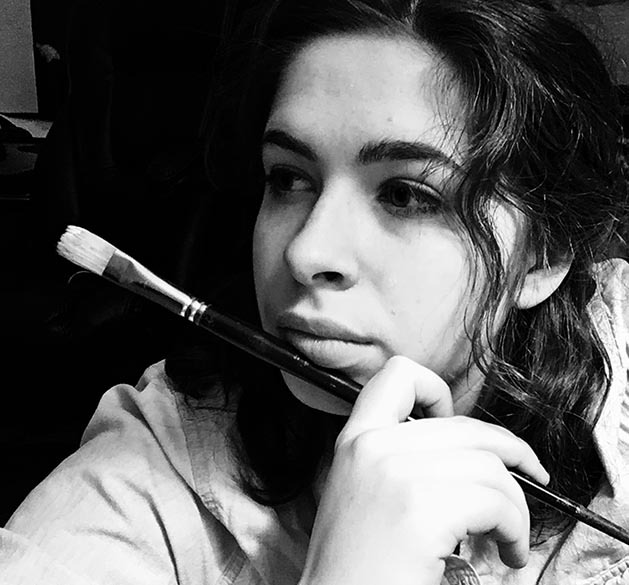 Jordan Slater is a student at Marywood University where she is pursuing a Bachelor of Fine Arts in both Painting and Illustration, graduating in the spring of 2020. She is a member of Zeta Omicron Kappa Pi, the International Art Honor Society, as well as Delta Epsilon Sigma, the National Scholastic Honor Society for Catholic Colleges and Universities. She was a blogger for Where Creativity Works, the Marywood art department blog, as well as an orientation leader for incoming freshmen. While at Marywood, Jordan has exhibited her work in many shows including Revelations, Reflections of Our Society, the annual Zeta Omicron show, and in First Friday, Scranton. In addition, Jordan has studied abroad in Venice and Padua. She plans to study at SACI, Studio Arts College International, in Florence for the fall 2019 semester. Outside of Marywood, Jordan is the Assistant Artistic Director of Occhipinit Dance company, where she has taught classes since 2012, and the Visual Arts Instructor at the Creative and Performing Arts Academy. She is also an intern at Jeff D’Angelo’s Design Group. Furthermore, Jordan is very active in the design community, creating logos, programs, menus, and illustrations for various local businesses.